Born in December of 1961, John Cornish, a native of Washington State, waited until age 29 to experience his first serious exposure to things crystalline and paleontological when he noticed treasures displayed at a friend’s home. Burning with a desire to learn more and to experience his own discoveries, a quick field trip soon resulted where marine fossils from local sediments immediately yielded a fascinating immersion into the exotic world of field collecting. During his most active year, he visited 113 mineral and fossil localities, all documented in Field Trip Journals, now chronicling a 20 + year pursuit and totaling several thousand pages of text and illustration! 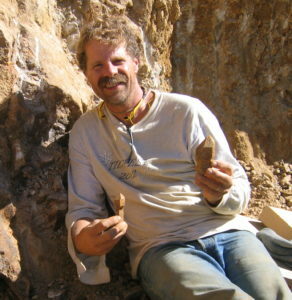 John owns, or is a partner in, several specimen mining properties in the western United States and specimens John’s collected grace the displays of many of the world’s premier institutions and collections. When home, John enthusiastically shares his passion for minerals and fossils through a presentation he calls, Geology ROCKS! Over 25,000 people have seen his talks, the majority presented within the Olympic National Park through an educational and environmental themed partnership. He owns and operates John Cornish Minerals and is represented at our country’s largest mineral shows as well as at local shows in the Pacific Northwest. Among his accomplishments, Asthenognathus cornishorum, a fossil decapod (crab), is the first fossil species to be named in his honor. Field Collecting, the ultimate mineral pursuit! In his picture-rich, fun-filled presentation, John will share some of the basic tools he’s used and experiences he’s survived during his 20 + years of specimen field collecting. The good, the bad and the dirty, he’ll share it all! Whether in a quarry basking under a Summer sun, down deep in the claustrophobic confines of an underground mine or digging away on the side of some wild unnamed mountain outcrop in the middle of nowhere, there is treasure to be found for those willing to brave the extremes. Spectacular specimens, scenery and bloodied knuckles, come along and share in the FUN!